Back in 2011, I wrote an article the primary focus of which was an attempt to postdict the effect of the humidor on home run production at Coors Field. The article was based in part on a piece of academic research I had done with my collaborators a few months earlier in which we did careful laboratory measurements of the effect of humidity on the weight and coefficient of restitution (COR, or the “bounciness”) of the baseball. The essential idea is that when a baseball is stored in a humid environment, it absorbs water, which has the dual effect of decreasing the COR and increasing the weight, both of which should result in a reduction in exit speed, all other things being equal. It might be helpful to review the basic facts about Coors Field, which long has been viewed as a batter’s paradise and a pitcher’s nightmare. 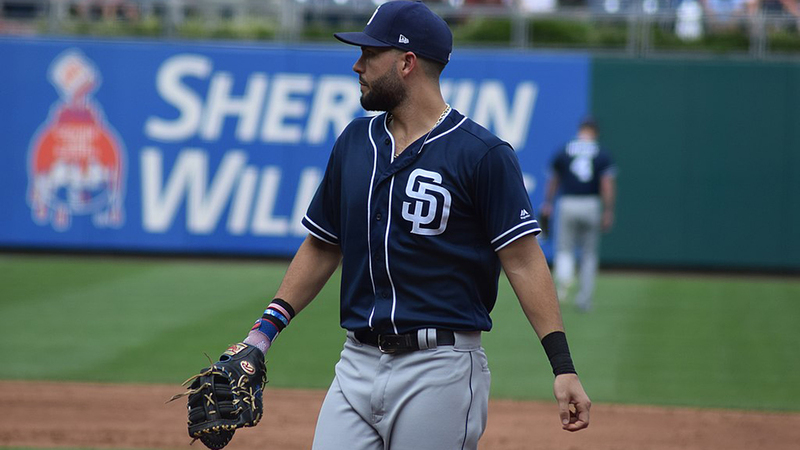 Because the air density in Denver is approximately 80 percent of that at sea level, fly balls carry farther and pitches have less movement, both of which contribute to an increase in a variety of offensive statistics, particularly home runs. For the first seven seasons at Coors, there were 3.20 home runs per game compared to 1.93 per Rockies away game. However, starting in 2002 the Colorado Rockies began to store their baseballs in a humidor at a constant 50 percent relative humidity and 700F, as opposed to the more typical 30 percent humidity in Denver. During the period from 2002-2010, the Coors ratio decreased to 2.39, a reduction of 25 percent, while the away game ratio stayed essentially constant at 1.86. To calculate the expected decrease in home run production at Coors required a three-step process. First, it was necessary to estimate how the elevated relative humidity (from 30 percent to 50 percent) affected the properties of the baseball–primarily COR and weight–resulting in a reduced exit speed. That was accomplished using laboratory measurements of the effect of humidity on the COR and weight, along with a physics model of the ball-bat collision to calculate the effect of these quantities on the exit speed. Second, using the reduced exit speed, an aerodynamics model for the flight of the baseball was used to calculate the reduction in flyball distance. Finally, actual home run data, courtesy of ESPN Home Run Tracker, were used to calculate the reduction of home runs expected from the reduced distance. Amazingly, the calculated reduction in home runs at Coors, 27±4 percent, agreed essentially perfectly with the actual value of 25 percent. In the course of this work, there were stories reported that the Arizona Diamondbacks were considering installing a humidor at Chase Field. So we decided to use the same technique to extend our calculations to Chase, where the relative humidity is even lower, about 20 percent, than at Coors. Therefore, we expected and found an even greater reduction in home runs, 37±7 percent, than at Coors. Interestingly, the plans to install the humidor subsequently were abandoned. I realize correlation is not necessarily causation, but it is very tempting (not to mention flattering) to think there was a causal connection with our article. With all due respect, Mr. Hall, it has made a huge difference at Coors, at least with respect to home run production. Moreover, if our previous analysis is even close to being correct, it will make an even larger difference at Chase. To prove that, I decided to dust off my old calculations and come up with an updated prediction. And unlike our earlier postdiction for Coors, the new prediction soon will be tested. In other words, I am really sticking my neck out here. I first use Data Set 1 to compare home and away mean exit speeds for D-backs batters. 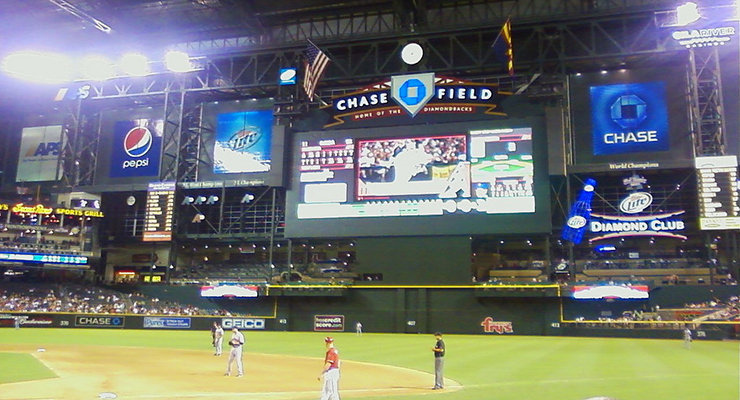 The essential idea is that higher exit speeds would be expected for the home games at Chase Field due to the elevated COR in the drier climate. A home/away comparison is shown in Figure 1, where the histograms have been scaled so that the same number of batted balls appear in each plot. Since I am considering only home runs, only events in the launch angle range 20-35 degrees — encompassing about 90 percent of total home runs at Chase — are included. The left plot shows the full distribution, the right plot a blowup of the region above 90 mph, which is the region most relevant for home runs. 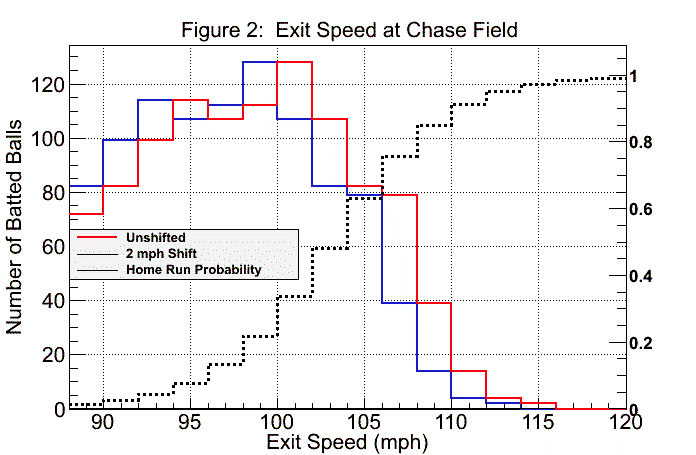 The mean exit speed is 91.9 and 89.9 mph for home and away, respectively, a clear-cut two-mph shift to higher speed for games played at Chase. The shift is particularly apparent for exit speeds above 100 mph, as the right plot most clearly shows. At this point I want to digress briefly to comment on how compatible a 2-mph shift in exit speed is with expectations based on how the baseball properties depend on relative humidity. In fact, based on a starting point of 20 percent and elevating to 50 percent (both at 700F), the physics-based calculation predicts a shift of about twice that, or 3.8 mph, which is essentially identical to the 4.1 mph shift we found in 2011, despite the improved ball-bat collision model. I am puzzled by this discrepancy and wish I understood it better. But I don’t and will proceed with the analysis assuming a two-mph shift, but also realizing the effect on home runs could be even greater. I will return to this point shortly. Given the two-mph shift in exit speeds, the analysis now proceeds along the same lines I used in an article I wrote last year about the increase in home runs starting with the 2015 All-Star break. 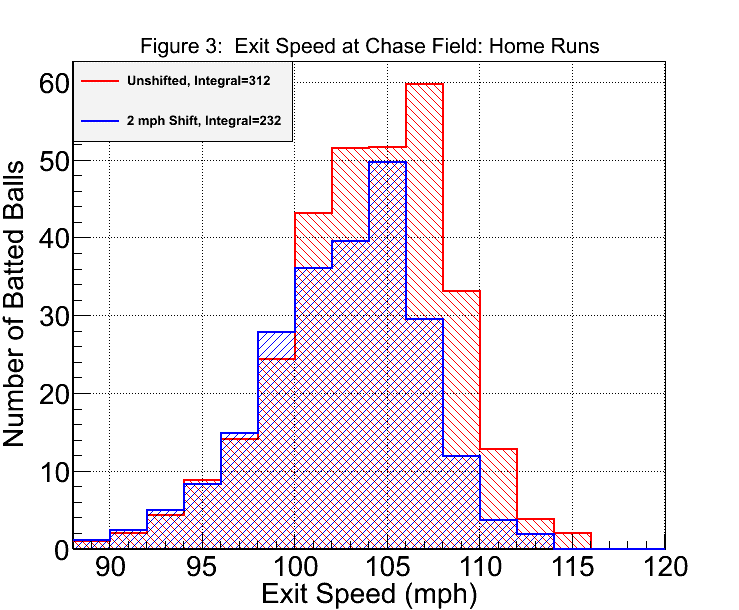 Using Data Set 2, which are batted balls at Chase Field (both home and away teams), and once again restricting the analysis to balls hit in the range of launch angles between 20 and 35 degrees, I plot in Figure 2 the distribution of exit speeds — both the actual exit speeds (red) and the same exit speeds shifted downward by two mph (blue), the latter simulating the effect of the humidor. The dotted curve shows the home run probability as a function of exit speed, which varies between zero and one and is a smooth fit to the Statcast data. Given that the exit speed distribution is falling rapidly in just the region where the home run probability is increasing rapidly, it is not hard to imagine how a seemingly small shift in exit speeds can have a very large effect on the number of home runs. This is further apparent by the curves in Figure 3, which were obtained by multiplying the exit speed distributions by the home run probability for each 2 mph bucket of exit speed. The resulting curves are the distribution of exit speeds for balls hit for a home run. The area under each curve is the expected number of home runs, which is 312 for the actual data and 232 for the shifted data, a 26 percent reduction. 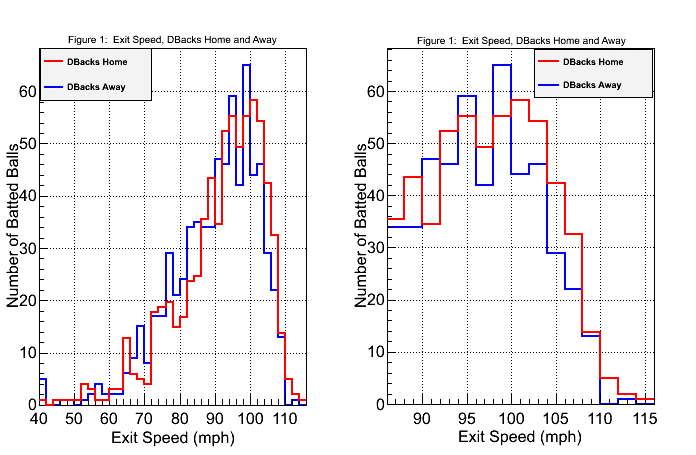 If the actual shift in exit speeds were four mph, as the physics-based calculation predicts, the expected number of home runs would be 164, a reduction of 47 percent. Interestingly, the average of these two results is 37 percent, exactly the value found in the 2011 analysis. However, this perfect agreement is surely fortuitous, given the very different techniques and data utilized back then. So what do we conclude? I am very comfortable saying that, with the humidor running at 50 percent and 700F, there will a reduction in home run production at Chase by 25-50 percent. While it would be nice to come up with a more precise prediction, we should not lose sight of the principal takeaway that the installation of a humidor will reduce the number of home runs substantially. Alan Nathan is professor emeritus of physics at the University of Illinois. Visit him at his website, The Physics of Baseball, and follow him on Twitter @pobguy. Wouldn’t the massive difference in elevation between Chase Field and Coors Field factor in to a less dramatic reduction in Home runs that you’ve concluded will happen? I didn’t see you factor that into any part of your discussion about Chase Field installing the humidor, only factored in when discussing Coors in the early part of the article. I can’t speak for Alan but he’s only addressing EV. Altitude (air density) has little to do with that. What happens after the ball leaves the bat is another story and mostly independent of the effects of increased weight and decreased COR although to some extent the air density may affect the effect of change in weight. In other words a decrease in EV of X should decrease home run rate by R regardless of the air density. Obviously for any given EV the ball flies a lot farther at Coors than at Chase. Joe I would think that humidity has very little effect on the properties of the bat. Humidity certainly has a major impact on wood flooring and wooden instruments. Why not bats? The reason I ask my above question is that if the balls are not kept in the humidor long enough before being used in play, the reduction in home runs will be drastically lower than your prediction. Likewise if they are removed from the humidor too long before being used. Does the COR change the pitch at all? Could the higher COR and lighter balls lead to faster pitches, therefore decreasing movement? This could lead to more “barrels” and a higher sample in the same launch angle. And if the humidity changes the ball, it could make the bats lighter, as someone mentioned earlier. That missing 2% is one of my favorite things about baseball. There’s so many variables its almost impossible to nail them all down at once. As to bats and absorbing or losing water content to humidity, that impact has to be very minimal but beyond that, I would think bats would take months to adjust to changes in humidity. As such, bats are pretty much unaffected by the changes in humidity – the DBacks’ bats would be dry even after a road trip and the visitor’s bats wouldn’t have enough time to adjust to the dry desert air in just a few days. A 25-50% reduction? No way! Chase was 4th in HR’s last year with 221 – only 6 ahead of COL (Seattle led with 234/SF was last with 119). A 25% decrease would drop them to 24th based on 2016’s numbers. 50% would put them dead last with 111. – Will it have any effect on fastball spin rate? If these are impacted, these might have an indirect effect on HR rates? Have the Diamondback said that they will set the humidor to 50 percent and 70°F? If they read your articles and don’t want that big of a reduction in home runs, couldn’t they use a different value, say 40% humidity? What would a 25%-50% reduction in HR rate translate to in terms of expected runs/game? According to the articles I read, through 50%/70F is specified by MLB. My guess is that ultimately every team will store their baseballs in that environment. Grip will improve at 50%, probably resulting in greater spin. I think MGL comment about the 2mph is that the implication that the humidor will set the ball at Chase equivalent to what the ball is on the road. Good stuff! For what it’s worth, I plugged the 2mph delta into the Deserved HR model (at BaseballHQ.com) and got a similar result: minus 27% HR for Chase field. I plugged in 3.8 mph and confirmed a 49% reduction. Kanye West’s “Cream White” Adidas Yeezy Boost 350 V2 drops Saturday, but one sneaker retailer almost had to call off its launch in the wake of an alleged robbery.